It’s been 2 months since my last Gotham News Update, and blimey quite a bit has happened. In fact as I started writing up this article the above photograph was released on a Twitter by TV Insider @TVInsider as we get an exclusive look at the cast Gotham as they prepare for their final battle. 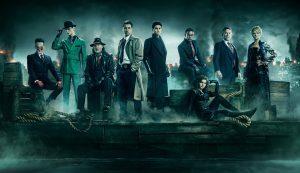 Gotham will return for its final season on Thursday 3rd January 2019, a lot earlier then I expected. Season five has been named Legend Of The Dark Knight I love this title as I feel we know exactly what Gotham is going to serve in its finale episode. More amazing news was announced, Gotham will also get its 100th episode as the network decided to extended season 5 to 12 episodes instead of the original 10. This instantly intrigued me because we already knew that “The Batman” would be appearing at the end of episode 10 which originally was the last episode. 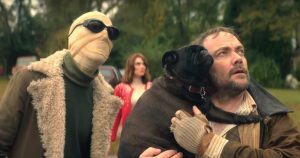 So my question was at this announcement will there be two extra episodes to bulk out the story and give more time for Bruce Wayne to become Batman or will we still get that 10 year in the future jump and see the characters in Gotham living in the city with the pointy ear stranger? But it was soon announced that Ben McKenzie would be writing another episode of Gotham and the original ending episode which John Stephens has penned will be the 100th. The final episode of Gotham starts filming on Thursday 29th November 2018 which was confirmed by Gotham writer and producer Tze Chun. 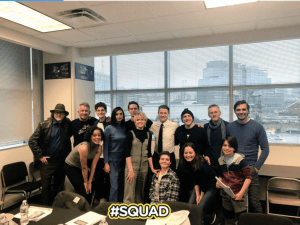 Last Monday as usual some of the cast gathered for their last ever table read of the script and as you can see from the above photograph Erin Richards(Barabra Kean) took to social media to announce she will be making her director debut on this episode of Gotham which is written by Ben McKenzie. 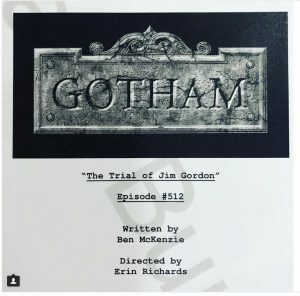 The title alone is intriguing The Trial of Jim Gordon and did make me chuckle. New York City is the place to be on December 12th at 7:30pm EST as Paley Live at the Paley Centre presents a preview screening of the premiere of episode 1 Season 5 of Gotham. Also in attendance and conversation will be the cast and the creative team behind Gotham. This is a ticketed event https://www.paleycenter.org/paleylive-ny-fall-2018 so Gothamites if you want to see the first episode of the final season before 3rd January this is the place to be. 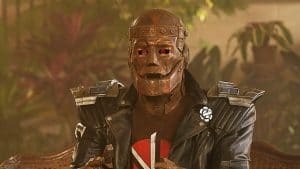 I will look forward to sharing all my thoughts and episodes recaps from Thursday 3rd January 2019 with you here at Dc World.